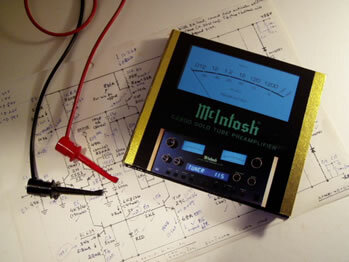 The c200 was subjected to the rigors of the McIntosh Audiophile Test Reference CD. In the opening track, Stravinsky's Firebird Suite was impressively dynamic and powerful. Track 3, Dvorak Symphony No9 in E minor, Op95 was simply glorious while Bizet-Shchedrin "The Carmen Ballet" brought a smile to my face. Aaron Copland's "Billy the Kid-Gun Battle" even managed to evoke some anxieties. It was in Starker Plays Kodaly, track 2, that the violins sounded slightly strained. This was again apparent in Vivaldi's Four Seasons in track 7. Switching speaker cables to normal CAT5 brought a huge improvement. Even though the c200 is not meant to surpass the performance of any of our amplifiers, it does give a pretty good account despite its' limitations. More importantly, it serves as a useful doorway for gaining experience in constructing discrete power amplifiers. I am sure you will enjoy this amplifier as much as I have in designing it.